I’ve said many times before that there is no single diet that is perfect for everyone. I hope that is clear by now. But even beyond that, there is no single diet that is perfect for one specific person, all of the time. Goals, circumstances and requirements change. One of the biggest determinants of what diet is right for you is your focus. Obviously it would be great if we could eat and live in a way that was “perfect” for optimal health, a cover model-like physique and elite level athletic performance. But this is not really possible. Now don’t get me wrong, you can be healthy, lean and perform great in the gym. Absolutely. No question. BUT when you want to get to the very extremes of each of those goals, your focus will have to move slightly away from the other two points. For example, if you want to be an elite level Olympic athlete you are probably going to have to do things that are probably not optimal for health. Like eat high amounts of carbohydrates throughout the day, train several times per day to the point where you are on the edge of breakdown and isolating yourself from many social situations for months at a time. It just comes with the territory. 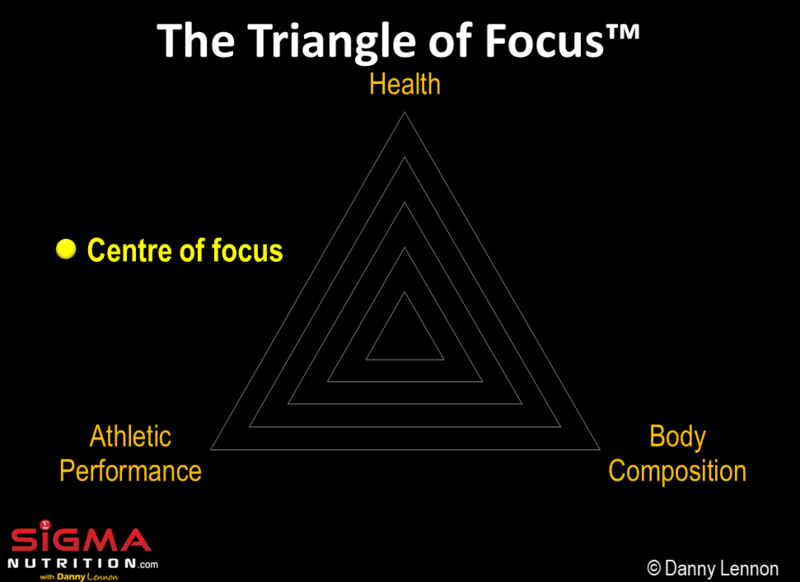 To explain the concept more clearly, I use something I call the “Triangle of Focus”. 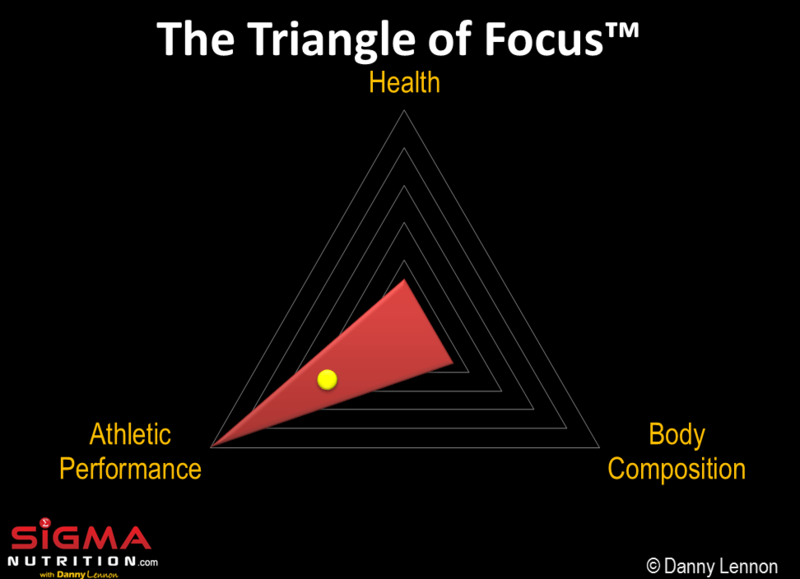 As you can see the Triangle of Focu has three points that correspond to a goal of your nutrition strategy. 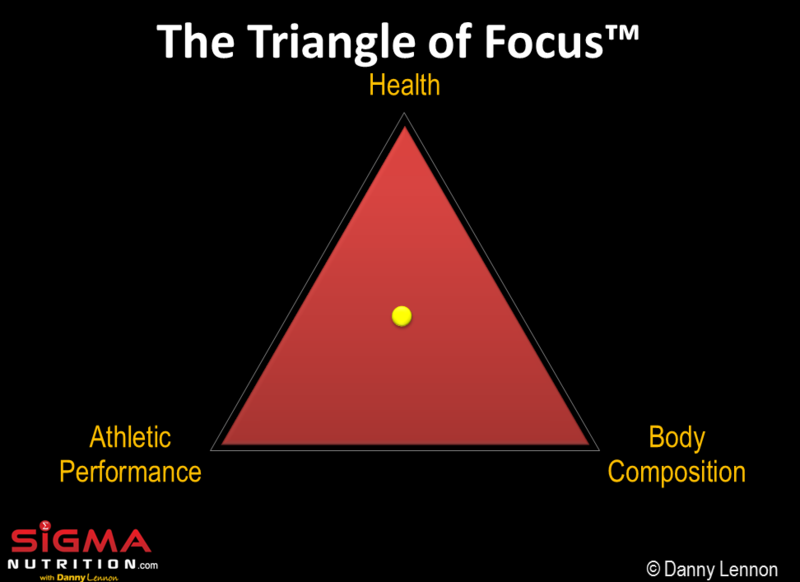 Where the yellow dot is located on the triangle will indicate how close or far we are to optimal nutrition for a particular goal. The closer we get to a certain point on the triangle means the eating strategy is excellent for achieving that goal. 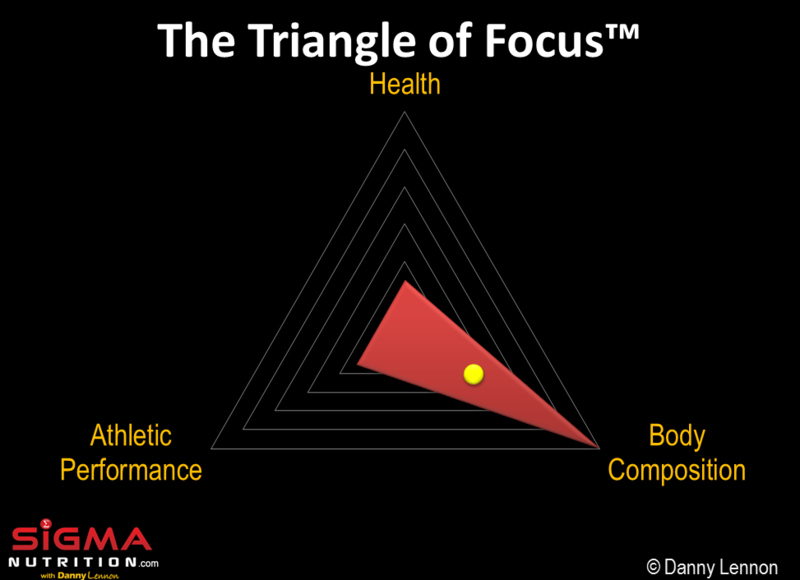 So let’s take the baseline starting point: complete balance between focusing on health, body composition and athletic performance. In such an instance we get a triangle that looks something like this. Here, the centre of our focus is the same distance from each point. So while it’s balanced, note that in order to achieve this balance we can never get that centre of focus right at the tip of any of those points. When optimal health becomes the priority, the end goal is to promote longevity, avoid chronic disease, feel mentally sharp and generally feel good and be energetic. The diet should emphasise eating high-quality, nutrient-dense foods and positive psychological associations with food and eating. There are important aspects of a diet that’s “optimal” for health that are often overlooked when only body composition or performance are considered. The more we move towards eating for optimal health, we are going to be doing things that may not be the perfect thing for body composition and athletic performance. First, just to clarify something: caloric intake is important. Sure, at higher body fat levels it probably isn’t essential to actively track calories. Food quality, eating habits and re-setting body cues should be the initial goals and can result in great progress for many people. But what this is also doing is allowing someone to unconsciously reduce calorie by simply replacing highly-palatable, processed foods with satiating whole foods. However, the more that body composition goals become extreme in nature (say a lean individual getting to single digit body fat), then tracking calories and macros often becomes necessary. Regardless, when a person starts losing body fat they have done something to alter their energy balance. Are you a bodybuilder? Physique contest participant? Cover model? Elite athlete in a weight class-based sport? Some dude looking to get to 6% body fat? Or just so analytically minded you enjoy tracking calorie and macros? If so then you will likely benefit from actively tracking your calorie and macronutrient intakes. But what does such a focused body composition goal mean for your health and performance in the gym? Let’s take the example of a period of fat loss to get really shredded. At times like this you’re probably going to have to do things that aren’t 100% great for health, say like reducing calorie and fat intake to pretty low levels. This in turn has knock on health consequences, at least transiently in the shot-term. If you got a blood panel done on a bodybuilder during the final stages of contest prep I’d put a pretty hefty bet on his testosterone being through the floor. Another strongly body composition orientated goal is to eat for significantly increasing muscle mass. At an advanced level, this requires a consistent flood of a high-amount of nutrients into the cell (energy overload). Pushing significant amounts of energy (i.e. calories) through the mitochondria might not be the best for long-term health due to the oxidative stress it can induce, as discussed by the brilliant Chris Masterjohn, PhD. It’s important to first clarify who exactly is an “elite athlete”. If you train twice a week and play a match on a Sunday with your local football team, then you’re not an elite athlete. You may even train everyday but unless you are physically capable of producing extremely high work output, have training sessions in the double figures per week and compete at a high level then you’re not really an “elite” athlete. But aren’t athletes in great shape and eating healthily? Yes, this is true in many cases. But it doesn’t mean they aren’t doing things that are not the best for their health. Similarly, if you are an elite athlete you probably won’t want to focus on being absolutely shredded with lots of muscle mass. For example, take the ridiculous hypothetical example of a competitive soccer or rugby player who drops to 6% body fat. How is that going to work out for them performance wise? Not good. The closer they move to extreme body composition goals the further away their centre of focus gets from their athletic performance point. Hopefully the these graphics were helpful in outlining just why there is no right or wrong when it comes to nutrition. Don’t tell someone they’re doing something wrong until you understand WHY they’re doing it. What are they trying to achieve? You may think you’re giving good advice in saying people should eat low-carb diets but don’t judge that guy over there hoovering up that bowl of rice. He may care most about his performance. That may very well be EXACTLY what he needs to be doing. Similarly, while I may tell people that they should avoid highly processed foods most of the time, if someone is only focused on body composition, is willing to track calories/macros and the chocolate fits their macros, then who is anyone to chime in and say “you’re doing it wrong”. 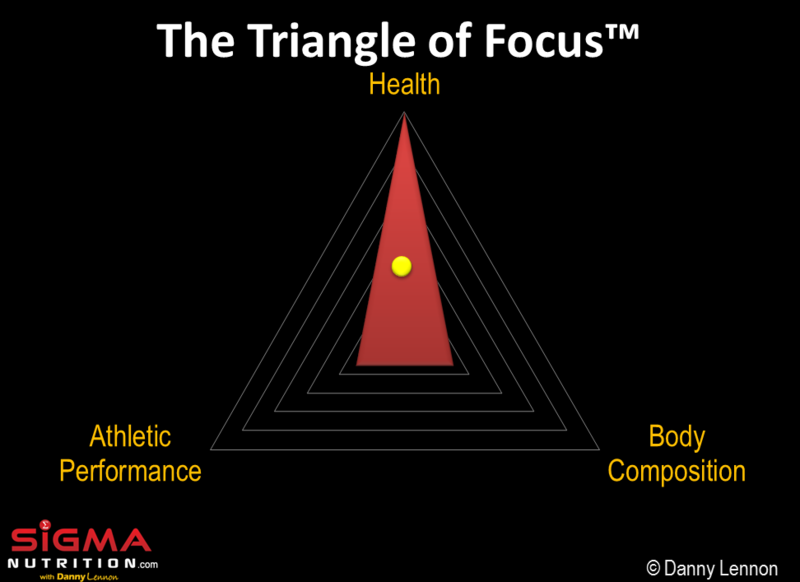 The more you narrow you’re focus on one point on the triangle, by nature you’re going to have to do certain things that may mean you never meet the extremes of the other two goals. If you just want a balance then this is cool. Just know that you’ll never be an optimally healthy, Olympic athlete and look like a competition level bodybuilder all at the same time!